Africa’s largest country is mostly covered by the Sahara desert. Large oil and natural gas deposits sit beneath the sandy and rocky terrain, making Algeria the wealthiest African nation. The Sahara desert is found in the northern part of Africa and covers roughly 10% of the continent (3 500 000 square miles). It stretches from the Red Sea to the Atlantic Ocean. It covers many African nations, such as Chad, Egypt, Libya, Mali, Mauritania, Morocco, Niger, Sunda, Tunisia and (of course) Algeria. Despite taking up almost 10% of the African continent, this is not the largest desert in the world – only the largest hot desert. The largest desert is in fact the continent of Antarctica at around 5,000,000 square miles. 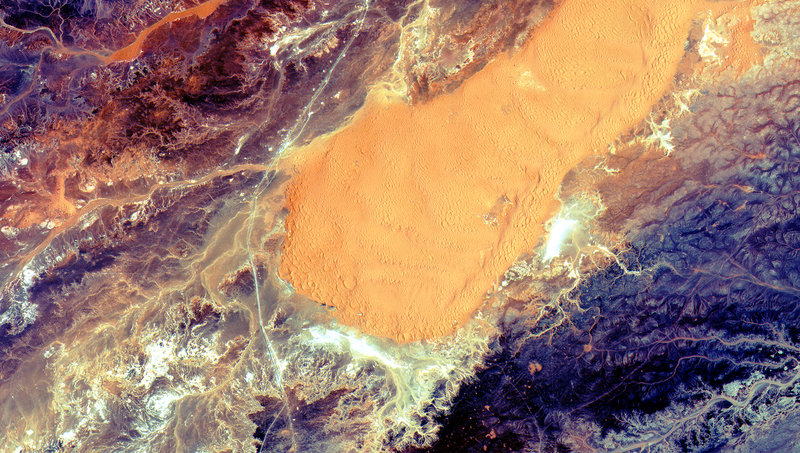 The area pictured is just over 55 miles south of El Ménia oasis – also known as El Goléa – in Algeria’s Ghardaïa province. Sentinel 2A was launched in June, designed specifically to deliver the wealth of data and imagery that are central to the European Commission’s Copernicus programme. Let us know what #space image you think should be the next #IOTW through Twitter, Facebook anda Instgram. What to recieve regular email updates?